If you are a town person, this place shouldn't be a complete stranger to you. Located at Mandarin Gallery, Arteastiq is one of my favorite tea places to hang out at when i'm in town. And for those who do not like the idea of sipping tea pretentiously and chit chatting with your friend, you can opt to go to Art Jam, just located beside Arteastiq's tea house. Art Jam is a painting studio that allows people to paint and explore their creative side. You are given most of the materials you will need to paint a decent picture (not Picasso quality unless you are a natural talent), as well as a 3 hour session to paint up something, alongside some assistance from the friendly staff. 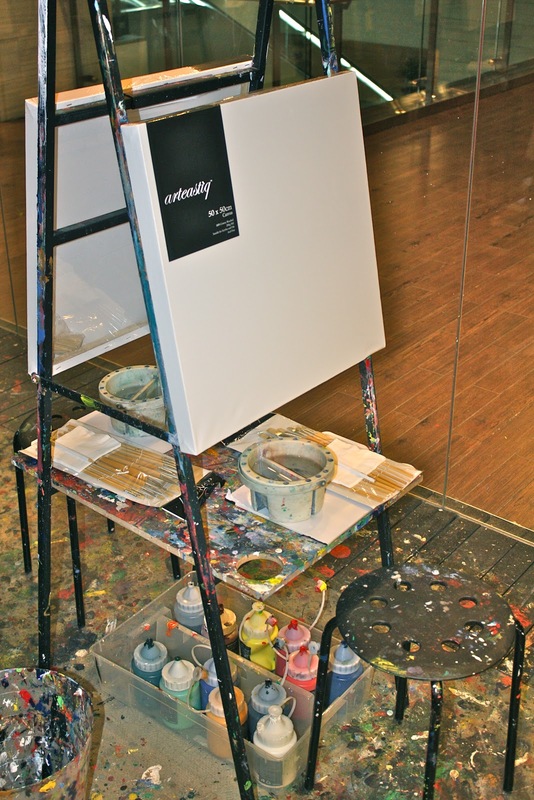 Each session comes with a canvas and unlimited amount of acyrlic paint, as well as a set of brushes that come in different sizes. Really, almost everything you need a complete a painting, except that you might need to mix your own paint to get some colors you desire. The canvas size is pretty huge in my opinion (50cm x 50cm), or if you are feeling a bit more ambitious you can go for the 60cm x 80cm. There are allocated time slots to each session (3 hours per session), which you can check out on their website. If you are an amateur, or a beginner like me, the time is enough to paint a whole canvas (50cm x 50cm), but if you are the kind that goes for details, one session might not be enough. However, you can have an extension of time for a small fee if you want to. Each session comes with a drink included as well. I highly recommend the Iced Lychee Tea, which happens to be one of my favorite drinks to order each time i am at Arteastiq. And yes, if you are anticipating to see what i painted (that was a complete disaster), i attempted (note : the word "attempted") to paint a Yayoi Kusama spotted pumpkin, which ended up looking like a distorted pumpkin with rotten spots. They provide a hair dryer for you to dry your paint as well, so you won't have to worry it won't dry in time. If you do not know how to, the staff there would be happy to assist. I must say i was very impressed with the helpful staff who taught me how to mix the paint and the techniques of painting. I wouldn't want to think how my painting would have turned out if it wasn't for her advice. My partner on the other hand, managed to paint something more decent (something along the lines of different faces) - abstract art. But still, for the effort i had put in, i think it's not bad and pretty commendable, given my pumpkin still looked like pumpkin, and that i got my colors correct (with the help of the staff). Art Jam offers promotions for couples, friends or even a big group of people that are interested in painting. The experience is worth the price since buying acrylic paint, brushes and canvas is going to set you back by a bit as well. Not forgetting that you will still need to have to clean up after painting, but at Art Jam, you don't. The only down side was that i accidentally stained my shirt while painting and that acrylic paint is pretty tough to get rid off. My suggestion is that you go in flip flops and inexpensive clothing so you can enjoy the process of painting without having to worry. They pack your canvas nicely for you after you are done, so you don't have to worry if it does not dry (acrylic paint cannot completely dry in 3 hours). Somehow the ingenious people at Art Jam packs it in a way your paint does not touch the box, so be assured it won't ruin your painting. All this included in the price you pay so you need not worry about extra cost as well. Each session is SGD 48, which includes everything i mentioned above. If you are a couple, there's a 1-for-1 deal on Mondays, which means you get 2 canvases for the price of one - that is probably cheaper than buying materials to paint yourself. You can also check out their promotions here, which includes student discounts, birthday specials, ladies night and friendship deals. As space is scarce, i recommend to give them a ring before heading down, and perhaps book the time slot you prefer. Or if you happen to be around town with nothing to do, this is certainly more productive than going shopping.